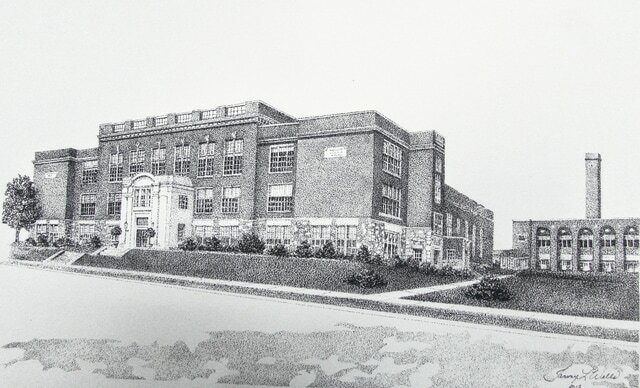 McClain High School is the subject of this year’s limited-edition print for the Rotary auction during the Greene Countrie Towne Festival next weekend. With the Greene Countrie Towne Festival just around the corner the Greenfield Rotary Club is looking for donations for its annual auction. This year’s auction is set for 1-3 p.m. on July 18 at the Fourth Street stage in Greenfield. Typically, donated items for the auction include art pieces, toys, lawn furniture, bikes, antiques, crafted items, coupons for services from local businesses, and more. Cash can also be donated, and will be used to purchase items from local businesses to supplement the auction. As with each year, limited-edition prints by local artist Tammy Wells will be auctioned off. This year’s print is a skillful rendering of McClain High School. September will mark 100 years since the school was dedicated and a celebration commemorating McClain’s centennial is set for Labor Day weekend. A medallion observing the centennial will be affixed to each of the prints. For more information on the centennial celebration go to mcclain100.org. Since the late 1980s the Greenfield Rotary Club has sponsored the festival, with the annual auction serving as the club’s primary fundraiser for the year. Through the years the auction has raised hundreds of thousands of dollars that have been channeled back into the community through the Ralph Philips Recreation and Civic Center, the police department and emergency services, city beautification, various services of the Greenfield Area Christian Center, supporting student clubs and activities, student scholarships, student academic needs, and several other organizations that serve the community. For more information on the auction or how to donate items, call Angela Shepherd at 937-763-3674 or Chuck Miller at 937-760-2898. Items for the auction can be brought to The Letter Shop at 247 Jefferson St. in Greenfield. For more information about the Greene Countrie Towne Festival, including a schedule, go to greenfieldrotary.org and click on the festival tab. Vendor forms, as well as various forms for other festival activities are also available on the website.